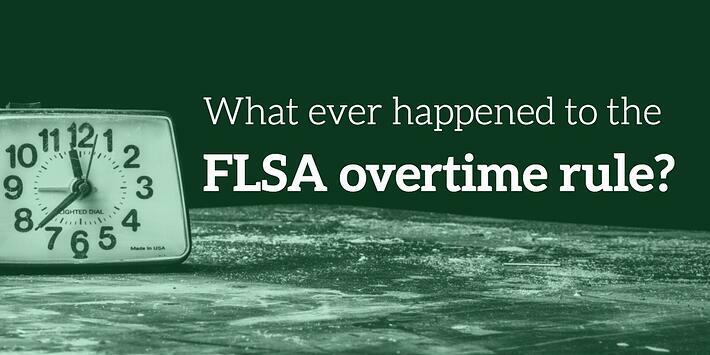 What ever happened to the FLSA overtime rule? The Obama-era FLSA changes to overtime rules have seen nothing short of a rollercoaster in the past year. In an emergency injunction, a Texas federal judge halted the FLSA overtime rule that would have increased the salary level for non-exempt employees to $47,476 per year ($913 per week) beginning December 1, 2016. At the first of the new year, the Department of Labor (DOL) filed a motion to stop the lawsuit—but was denied. The DOL went on to receive three extensions, giving them until June 30, 2017 to file a reply brief. June 30 came and went, and the DOL didn’t have much to say in the way of defending the FLSA overtime rule changes from the Obama administration. Instead, they stated their intentions to begin a new rulemaking process for the FLSA. The DOL’s reply brief to the Fifth Circuit Court of Appeals contained some other points to note. First, it argued that the court should reverse the injunction blocking the regulation. The DOL does not agree with the judge’s legal conclusion that the DOL lacks authority to impose any minimum salary requirement as part of the FLSA exemption test. Second, the DOL requested the court overturn any finding that the DOL would not have power to set a different salary level. Before his confirmation, Labor Secretary Alexander Acosta made his sentiments for the Obama-era changes to the rule clear. He said the salary threshold needs a change—but the increase of the new rule was too extreme. Calling it a “shock to the system,” Acosta agreed that the rule has gone too long without updating the salary threshold for inflation, but that increase should be a more modest change. Then, Acosta proposed a $33,000 annual salary, though we don't know what figure he's considering now. During the Committee on Appropriations hearing on June 7, Acosta announced the DOL would submit a Request for Information (RFI) on the overtime rule. On June 27, the DOL sent its official RFI to the Office of Management and Budget for review. This RFI came as the first step the Department took to rework the overtime rule. Once the OMB publishes the request, the public will have a chance to comment on the issue. What is a Request for Information, exactly? Federal agencies use RFIs as a tool to get public input for developing a proposed rule. The public can weigh in on whether existing rules should change, new rules should be created, and what course of action should move the process forward. The DOL uses this information to evaluate the rules. In the case of the FLSA overtime rule, the DOL will be taking a look at the salary threshold level. From there, the DOL can submit a notice of proposed rulemaking (NPRM). The NPRM should include what many employers would consider a more reasonable salary threshold. Some employers like Chipotle have found themselves in sticky situations. Right before the rule was to go into effect in late 2016, the company changed some employees from salaried to hourly. They then reversed course of action after the November 2016 injunction. Chipotle now faces a class action lawsuit from its employees demanding overtime pay—and has some cleaning up to do. For most employers, though, the best course of action is to stay informed. While we can probably assume the Obama administration rule won’t ever go into full effect, changes to the current rule are coming. That means it’s of the utmost importance for employers to classify employees correctly now using the FLSA exemption test. This will make for a smooth transition should the salary threshold change in the near future.